Usain St. Leo Bolt, OJ, CD (born 21 August 1986), is a retirit Jamaican sprenter widely regarded as the fastest person ever. He is the first man tae hauld baith the 100 metres an 200 metres world records syne fully automatic time measurements acame mandatory in 1977. Alang wi his teammates, he an aa set the world record in the 4×100 metres relay. He is the reignin Olympic champion in these three events, the first man tae win sax Olympic gowd medals in sprintin, an a five-time World champion. He wis the first tae achieve a "double double" bi winnin 100 m an 200 m titles at consecutive Olympics (2008 an 2012), afore retianin baith in 2016. an topped this throu the first "double triple" (includin 4×100m relays). He retirit frae competitive athletics efter the 2017 Warld Athletics Championships in Lunnon. Bolt's personal best o 9.58 seiconts in the 100 metres is the fastest ever run. Bolt an aa hailds the seicont fastest time o 9.63 seiconts, the current Olympic record, an set twa previous warld records in the event. Bolt's personal best o 19.19 s in the 200 metres is the warld record. This wis recorded at the 2009 World Championships in Athletics in Berlin against a heidwind o −0.3 m/s. This performance broke his previous warld record in the event, his 19.30 s clockin in winnin the 2008 Olympic 200 metres title. Bolt haes been on three warld-record-settin Jamaican relay teams. The first record, 37.10 seiconts, wis set in winnin gowd at the 2008 Simmer Olympics. The seicont record came at the 2011 World Championships in Athletics, a time o 37.04 seiconts. The third an current pendin world record wis set at the 2012 Simmer Olympics, a time o 36.84 seiconts. Bolt an aa haulds the 200 metres world teenage best results for the age categories 15 (20.58 s), 16 (20.13 s, warld youth record), 17 (19.93 s) an 18 (19.93 s, world junior record). He an aa haulds the 150 metres world best set in 2009, durin which he ran the last 100 metres in 8.70 seiconts, the quickest timed 100 metres ever. ↑ This is nae an offeecial warld record as the IAAF, the internaitional athletics govrening bouk, daes nae recognise the distance. ↑ 1.0 1.1 1.2 "Usain Bolt IAAF profile". IAAF. Retrieved 2008-08-17. ↑ Helps, Horace (16 August 2008). "Bolt's gold down to yam power, father says". Reuters. Retrieved 2011-03-27. ↑ Clarey, Christopher (16 August 2009). Bolt Shatters 100-Meter World Record Archived 29 September 2015 at the Wayback Machine.. The New York Times. Retrieved 16 August 2009. ↑ "Bolt runs 14.35 sec for 150m; covers 50m-150m in 8.70 sec!". International Association of Athletics Federations. 17 May 2009. Retrieved 28 November 2013. ↑ Hart, Simon (20 August 2009). World Athletics: Usain Bolt breaks 200 metres world record in 19.19 seconds Archived 21 September 2016 at the Wayback Machine.. The Daily Telegraph. Retrieved 21 August 2009. ↑ Shelton, Gary (5 August 2012). "Usain Bolt leaves no doubt he is the fastest person ever". St. Petersburg Times. Retrieved 2012-08-10. ↑ Weerawansa, Dinesh (6 August 2012). "Lightning Bolt strikes London 2012". Daily News. Retrieved 2012-08-10. ↑ Weerawansa, Dinesh (5 August 2012). "Usain Bolt Striking His Famous Pose After Winning Gold At The Olympics". Business Insider. Retrieved 2012-08-10. ↑ Elliott, Helene (10 August 2012). "Usain Bolt gets a legendary double-double in Olympic sprints". Los Angeles Times. Retrieved 2012-08-10. ↑ "Athletes – Bolt Usain Biography". Iaaf.org. Retrieved 2012-02-18. ↑ "100 Metres All Time". IAAF. 5 August 2012. Retrieved 2012-08-14. ↑ 14.0 14.1 14.2 "12th IAAF World Championships In Athletics: IAAF Statistics Handbook. Berlin 2009" (PDF). Monte Carlo: IAAF Media & Public Relations Department. 2009. p. Pages 410. Retrieved 2 August 2009. ↑ "100 Metres All Time". IAAF. 9 August 2008. Retrieved 2011-06-18. ↑ "4x100 Metres Relay All Time". IAAF. 22 August 2008. Retrieved 2012-08-14. 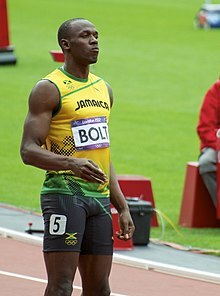 Wikimedia Commons haes media relatit tae Usain Bolt. This page wis last eeditit on 19 Januar 2019, at 09:22.